Athletic Muscle Performance. Enhances muscle endurance. Improves recovery time. Taurine or L-Taurine is an amino acid that is considered to be the second most abundant in the body’s muscle after glutamine. 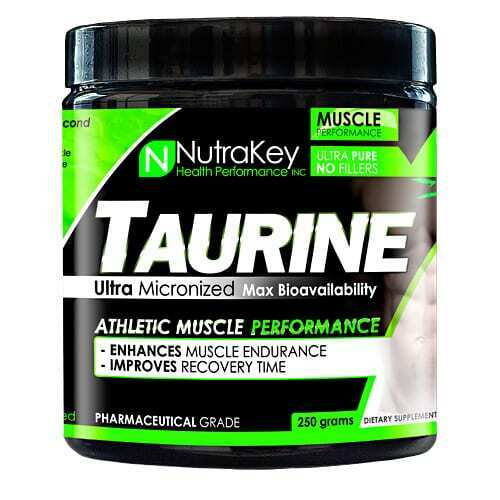 Taurine has been known to increase muscle mass, muscle strength & power, reduce muscle damage caused by exercise, accelerate recovery between workouts, and may also have an inulin-like effect in the body, helping to load essential neutrients into muscle. High muscle concentrations of Taurine seem to be of the utmost importance for high performance athletes. A relatively high amount of studies have been performances on Taurine. A two week study involving Taurine depletion methods of intense and exhaustive exercise released that subjects who supplemented Taurine did not have any depletion of the amino acid in their body. Taurine differs from the most other amino acids because it is not incorporated into proteins. However, it does play many significant roles in the body including: osmoregulation, and modulation of excitatory neurotransmission and intracellular calcium levels. The average Taurine intake in humans is estimated at 60mg daily. With supplementation, one can far exceed this amount and readily increase Taurine levels in many tissues, which leads to enhanced physical performance.